The DMV is one of life's great ironies. There was a time, not that long ago, when trekking from one city to another meant surrendering an entire day, maybe more, to travel. You passed the time telling tales of knights and millers and wives of bath. But now, thanks to the automobile, the same trip takes, like, an hour. There's a catch, however: in order to maintain the privilege of saving literally entire days on a journey, once a year or so you have to wait in line at the DMV for as long as 30 minutes! Ain't nobody got time for that! It's a fresh, first-world Hell, and the only comfort is that everyone around you has to suffer this low point of human existence too. That is, unless you're Sidney Crosby. On Friday morning, Crosby made a surprise -- and surprisingly brief -- appearance at the Duncan Manor DMV office in McCandless (Allegheny County, Pa.) and, thanks to a special rule that celebrities get to bypass the line -- so as to get them out of there before their presence jams up said line further -- Crosby was allowed to skip right to the front. And while Crosby dashed in to renew his license like he was on a breakaway, the rest of the scum -- calm down, folks, I only consider you scum compared to Crosby -- toiled away in the bureaucratic version of the dead puck era. Some of said scum are furious. "I disapprove," said 46-year-old Susan Campbell of Cranberry, who later in the day spent an hour and half at the center off McKnight Road and waited in line twice to help her 20-year-old daughter, Jessica, renew her license before heading off to college. "He should have to sit and wait with everyone else." But that would be so disruptive, said her other daughter, Stephanie. After all, people waiting with Mr. Crosby would text pictures to their friends and his fans would overrun the DMV in no time, she said. Look at that. Crosby's mere presence caused the Campbell family to disagree. This is why you hurry him through. 30 minutes in that line and the DMV staff would be processing divorces and will changes too. Meanwhile, others blamed Crosby for taking advantage of the rule. You wear the "C", dammit! Show some leadership! "He probably should have waited," said one lady, who probably wouldn't have waited if she was a celebrity. It was the kind of gentlemanly behavior that won their family's admiration. "Those are the people fans learn to love and encourage their children to follow -- the ones that take the time to talk and be themselves," Ms. Campbell said. "It depends on what kind of character you want to show, and it depends on how you want people to talk about you." If I'm Ms. Campbell's daughter, I'm upset that my mom just compared having a conversation with a young me to waiting in line at the DMV. But maybe she's boring. 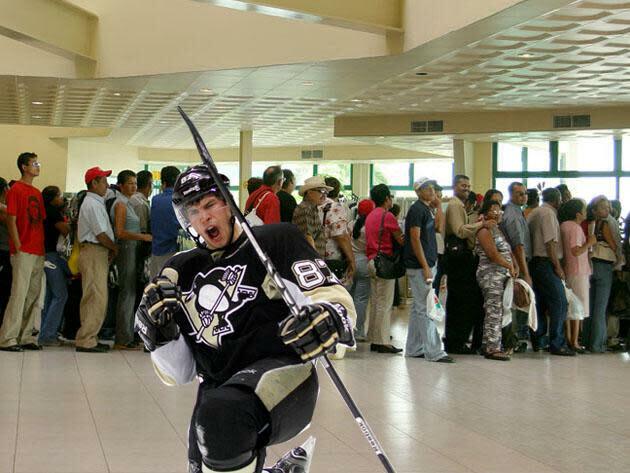 Anyway, Sidney Crosby is the worst, and the Allegheny County DMV is an enabler.